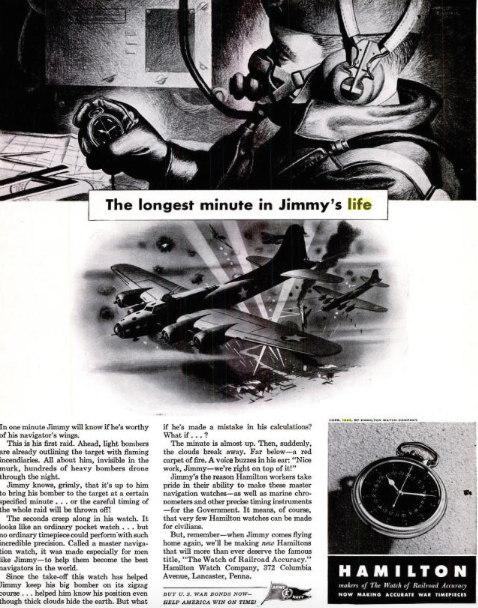 Hamilton's watch production was completely dedicated to the war effort during WWII. The 14/0 980 movements were used for bomb timers (timing bombing runs, not ticking down to exploding). 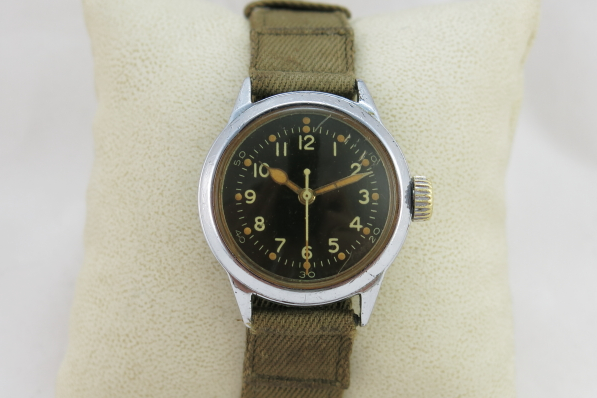 The 6/0 987A and 987S movements went into military wrist watches. 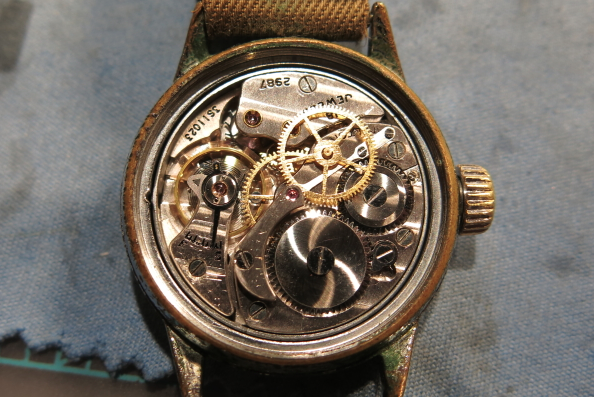 The 16 size 992B and 4992B pocket watch movements were used for navigation and transportation purposes. And of course, there were the 36 size marine chronometers. 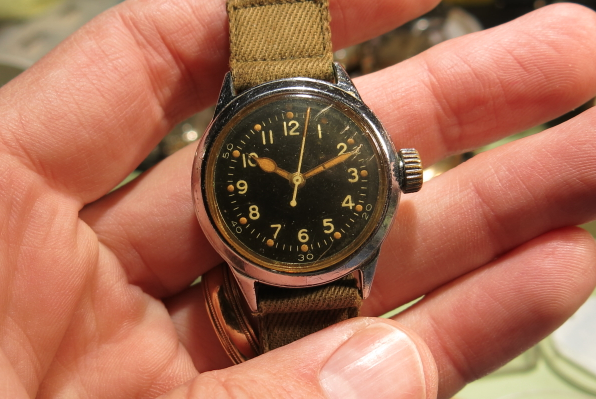 One of the variants of the 6/0 watches was the 18 jewel 2987. 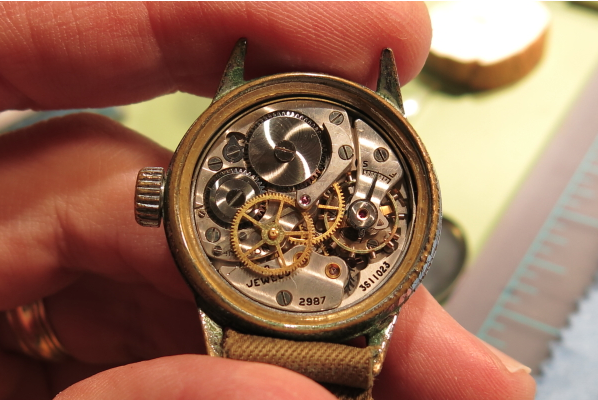 This watch was similar to the 987S but has one extra jewel - to support the second hand pinion. This watch was specifically made for Naval Aviators. I recently overhauled a 2987 watch and it was the first one I have ever seen. They're not overly rare - but they are usually quite expensive to purchase. As received, the crystal had long-turned yellow. 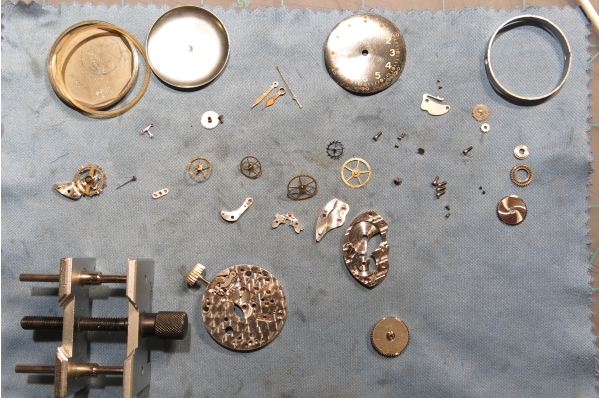 The watch would wind and wind and wind - a good sign that the mainspring is either broken or something is not connected inside. 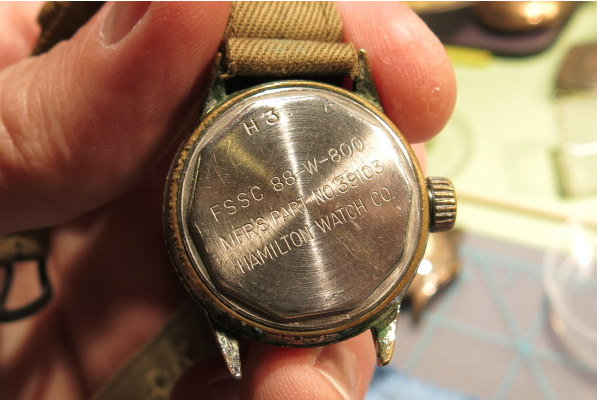 These watches feature a different engraving on the case back... the FSSC 88-W-800 was the contract that procured these watches for the Navy. 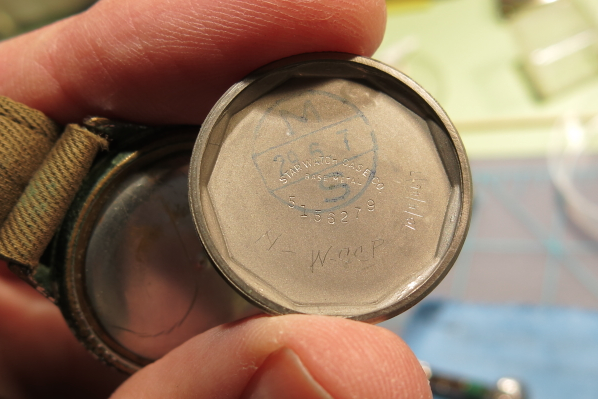 The case is made by Star Watch Case Company - as indicated on the case back as well as by the "S" stamped between the lugs. Inside the case you should find a dust cover and a rubber gasket. With the dust cover removed, you can see the 2987 is very similar to a 987S. 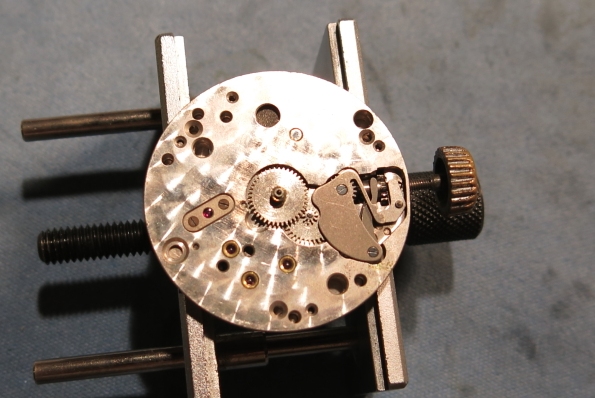 There are a few slight differences in addition to the extra jeweled bridge that supports the second hand pinion in the center. Once the stem is removed, the movement can come straight out the back. 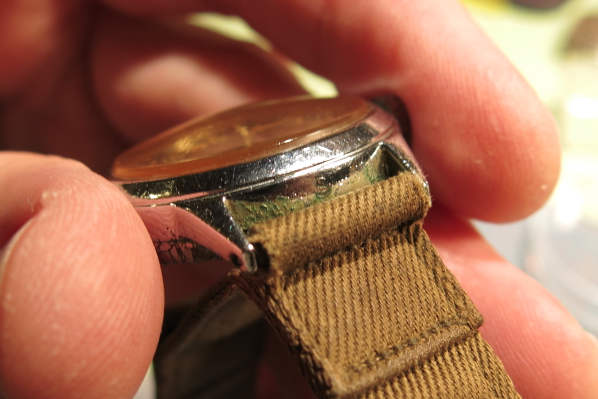 The movement ring that secures the watch in the case can be removed from the circumference of the watch. 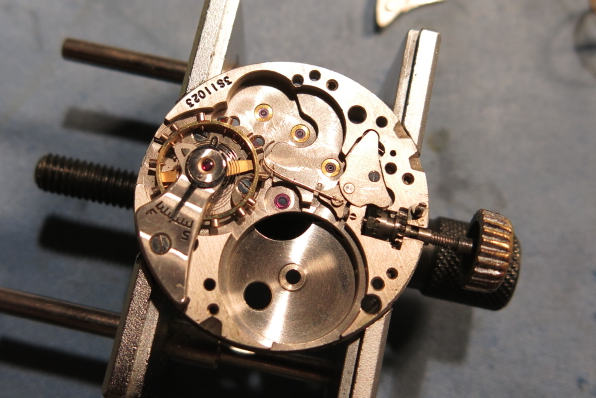 With the hands and the dial removed, the dial-side of the movement looks pretty much the same as your typical 987A movement. The 2987 is a hacking movement - which means it stops when you pull the crown out to set the time. In the shot below you can see the hacking linkage now that all the wheels and bridges are removed. 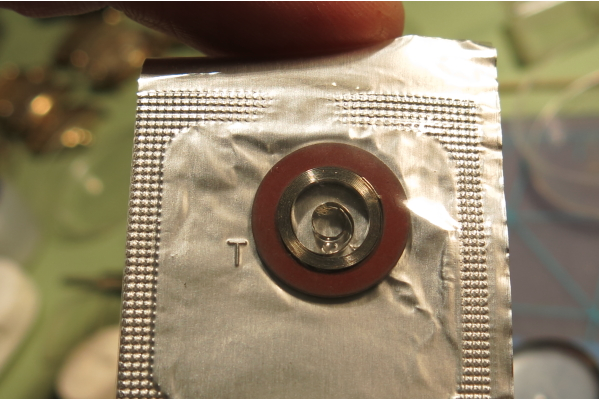 The hacking mechanism is a J-shaped spring that rests against the balance and stops it. It's in the stop position below. 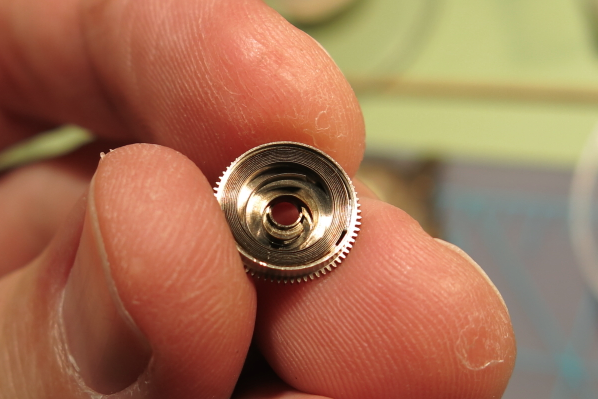 Inside the mainspring barrel, you can see the mainspring is clearly broken. A new white alloy spring comes precoiled to go into the barrel. You get one shot at installing it like this. Otherwise you need to rewind it with a mainspring winder. Now that everything is all cleaned and dried, it's time for reassembly. I hope I can remember where all these parts go! Actually, after doing this a few dozen times you develop a clear understanding of where every part goes. It turned out this watch had any iffy balance. One of the pivots was just a smidge short so it had a wobble when it ran. Changing balance staffs is a fine art for only the most accomplished watchmakers. So I just swapped out a balance from a spare 987A parts movement. 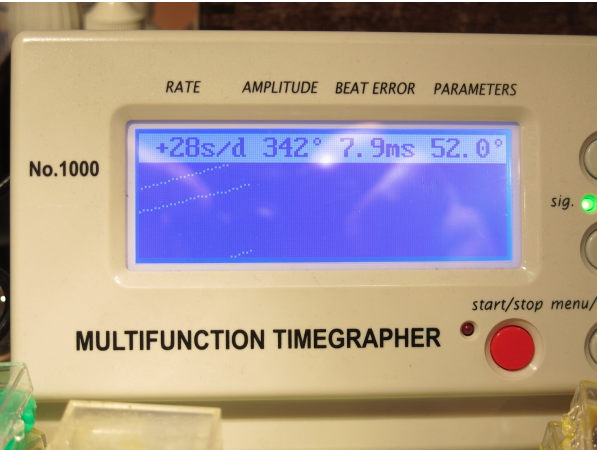 Now the watch is running fairly well and with great amplitude. A little tweak to the regulator will slow it down. I like to get the watch running and timed before I put the large seconds wheel back on. That way I can check the timing after it's installed. 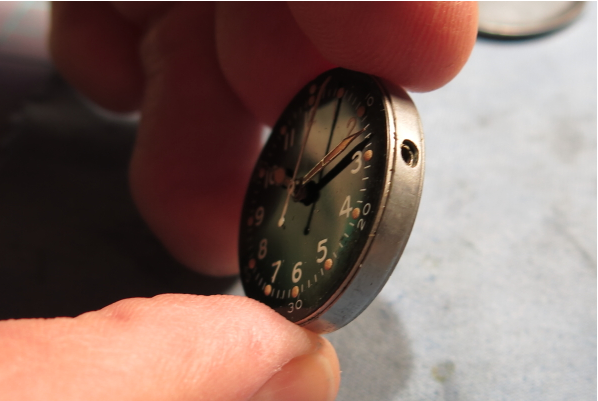 Everything checked out so the nice and clean movement (with the dial and hands) goes back into the case. The movement looks a lot cleaner in this shot than the one above... no? And here it is again - ready for another 70 years of service. Sorry for the slow reply. I don't know how to get a specific date based on your serial number but it's surely the early 1940s. 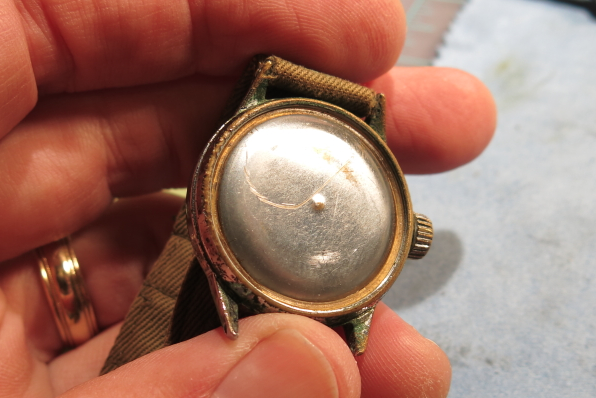 Depending on condition, you can get the dial and hands redone or the crystal replaced. Getting the case replated is possible but expensive. All you really need to do is keep the movement cleaned and oiled every 5 years or so. Do you have any photos of the crown? I'm looking to buy one myself and the seller tells me the crown is original, but I'm just unsure and would like something to compare it to.